Confronting racism and discrimination can be hard. The solution? Start learning techniques when you are young. 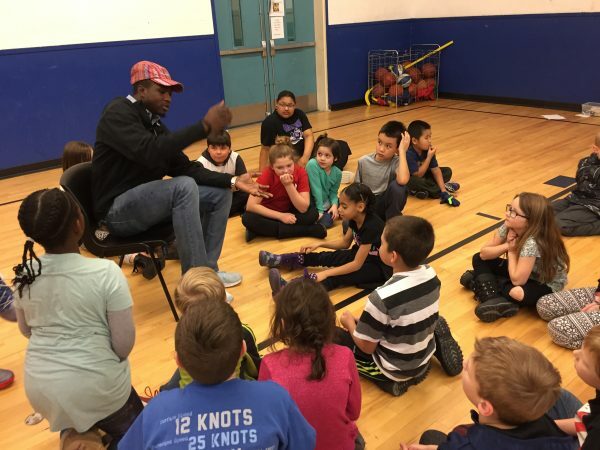 In parts of Anchorage, some of the teachers of these difficult lessons are other young people, but they start with the basics. Will Phillips, a seventh grader at Romig Middle School in Anchorage, said he’s “a lot of different races,” including Inupiat and Athabascan. Will said he tells his peers to ignore racism and not let it affect them. But Kayrick Felton, a program coordinator with Woodland Park Boys & Girls Club in Anchorage, said kids can’t really do that anymore. They see stereotypes and racism on TV and social media, and ignoring how that makes them feel isn’t healthy. That’s why he and other staff are helping the kids learn how to talk about race and differences through the Youth for Unity program. The program was created by the Boys & Girls Club over a decade ago but hasn’t been taught at the Woodland Park clubhouse for years. For the younger kids, the lessons tackle bias and discrimination indirectly with lessons that help them understand that everyone is different — and that’s okay. If we treat each other with empathy and respect, we can all get along. The staff at Woodland Park are trying a new approach with the curriculum. First, they teach the lessons to the middle school kids, then the older kids teach the younger ones. 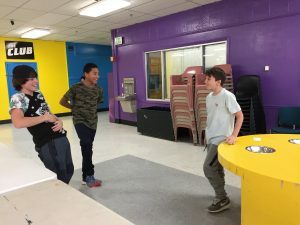 “Giving the teenagers an opportunity to lead something and actually take initiative instead of listening to it and putting it into the memory bank later — they get to use their knowledge instead of just having it,” explained Boys & Girls Club staff member Gabe Frommer. They said it also lets the kids show their leadership skills and build confidence. On a recent day in November, the middle schoolers were acting out skits to teach about expressing and identifying emotions. “Hey, Will! Hey, Will…” said Brayden Thom, while poking his friend. Other kids had to guess that Will was expressing frustration. After a few skits, the middle schoolers went into the gym with dozens of younger kids and led them in the exercise. Though the gym was a little chaotic, some of the kids, like second-grader Abigail Beck, got the basic point: understanding emotions helps you build relationships, no matter what your background. And if you understand each other, you can see past racial and other differences, and see when something hurts someone else. Though the program is new to Woodland Park, Tracy Hupe at the Eagle River Boys & Girls Club has been teaching Youth for Unity every summer for years. A diverse group of kids go to her clubhouse, and she said they don’t always understand each other’s cultures or how to interact at first. Then they start attending the program and teaching each other about their identities through different games and art projects. She said with in a few weeks, the program starts showing it’s effectiveness. “Whenever the kids get along and they don’t care what color their skin is or where they come from and they’re all playing together and playing the same game, then you know the program is working,” she said. Some youth express stereotypes and biases that they learn from parents or on social media, and this program helps them see past those, Hupe explained. It also helps young people eventually learn the skills to respond differently to racism, instead of trying to ignore it, like seventh grader Will suggested. She says through Youth for Unity, kids get to the place where they can successfully do that.